The provision of international services has increased enormously and remote servicing has become a substantial part of international trade. International services account for an ever-growing share in the gross domestic product, mainly due to the precipitous growth of the digital economy. Access to remote services is part of our day-to-day: We may ask a lawyer abroad for a legal opinion. We watch videos over the Internet via channels based in a cloud owned by a foreign company. Or we may consult an online doctor abroad for online diagnosis. In the absence of double tax conventions (DTCs), the payments received by these service providers are frequently subject to tax both in the state of residence of the service provider and in the other state in which the consumer is resident. Double tax conventions place the direct taxation of income from cross-border services usually in the hands of the countries where the service providers reside or maintain a permanent establishment (PE). However, as modern economies have left brick-and-mortar industries behind and intangibles have become the core of value creation, the need to connect the right to tax to the economic presence rather than to the physical presence of a service provider has become evident. In view of this, the concept of permanent establishment under double taxation conventions has been broadened over the time by way of interpretation, by the introduction of new provisions such as those on “service PEs”, and by the Multilateral Instrument of the OECD/G20. Following this trend, the European Commission proposes the introduction of a digital PE. 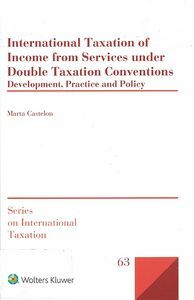 With her thorough analysis of the international taxation of income from services over the last two centuries, Marta Castelon, former research associate at the Max Planck Institute for Tax Law and Public Finance, sheds new light on present tax policy debates and develops workable proposals for bringing brick-and-mortar DTCs into the digital reality. Starting with an insightful historical account of the evolution of the PE threshold and the treatment of services in double tax conventions, the author presents her audience with an impressive comparative perspective of the state of the art in international tax policy, rich in detail, unraveling not only the existing variety of tax treaty practice but also the diversity of judicial approaches and scholarly work. She examines the subject with an abundance of case studies, treaty interpretations, appraisals of policy discussions, and practical solutions. In her concluding chapters Dr. Castelon reaches specific and highly useful recommendations for the future of tax treaty policy on income from services, taking on board foundational work by Brian J. Arnold and others on the allocation of taxing rights.